Why use chemicals to dye Easter eggs, when you can make all natural, homemade, organic food dye yourself? 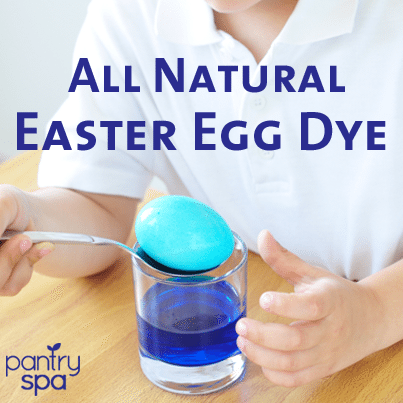 This recipe produces a gorgeous blue or purple / violet / lavender Easter egg dye that is totally safe, so that you can actually eat the eggs afterwards without a worry. 1. Mix together the water, white vinegar and either crushed frozen blueberries or red cabbage leaves. 2. Let it sit until you reach the shade of yellow that you desire. 3. You can either strain out the blueberries or red cabbage leaves at this point, or you can dye your Easter eggs in the solution without straining it first.